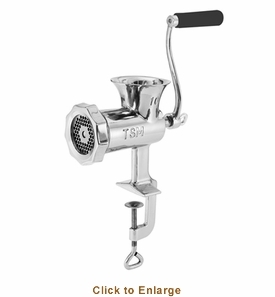 T.S.M.�s stainless steel #10 manual meat grinder (model 61210) has been designed according to the standards of the most demanding home chefs. This model�s �head held high� design means you can place a pan under the grinder spout, making it easy to set up your own �mass production� of great home made burgers and sausage. Conveniently the grinder�s sturdy mounting clamp will fasten on any solid surface of up to 2.5� thickness. 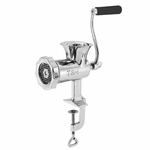 This S/S meat grinder comes fully equipped with 3/8" S/S grinding plate, S/S grinder knife, and a set of three stuffing tubes (plastic, sizes 1/2�, 3/4" and 1.25�). If you�re already devoting time to making your own sausage you know already about the importance of having good quality tools and this meat grinder is a winner.